When I opened up my newspaper Tuesday morning, the first thing that I saw was coverage of Prince William’s trip to Belgium to commemorate the 100th anniversary of the Battle of Passchendaele. I’d been concentrating on other things in my life and had forgotten that date was fast approaching. Canadians fought at Passchendaele, and while it doesn’t have the same place as Vimy Ridge in our national consciousness, it is still an important part of our history. One of our better war films was made about it. The importance of those battles fades with time – by Tuesday night the news stories were focused more on what William’s wife had chosen to wear to the ceremonies. Vimy Ridge impressed me in my brief visit. But I have spent far more time exploring the area around Ypres where the Battle of Passchendaele was fought. With that in mind, and because I was touched by what I saw, for the next few days I am going to repeat some of those observances from the summer of 2014. I really didn’t want to go to another museum. I had been to the In Flanders Fields Museum twice in five years, and didn’t think the recently renovated Memorial Museum Passchendaele 1917 would offer anything different. I was over-ruled. Turned out I was right. And at the same time I was wrong. Our hosts at the bed and breakfast we were staying at in Ypres told Vivian we should check out the museum, so we hopped a local bus for the trip to the next town of Zonnebecke. As you have probably gathered, I am a big fan of public transport, especially when travelling – it allows you to really get that local experience. The museum lived up to its billing, though there was very little new to me. However two things stood out. 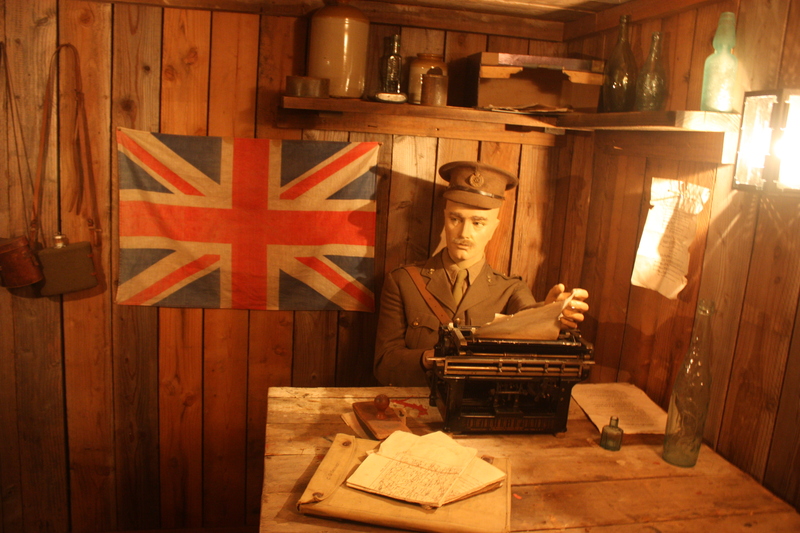 The first was a re-creation of a First World War tunnel system. I have been in the tunnels at Vimy Ridge, so I knew what it would be like. The exhibit was pretty good and I am sure many of the museum visitors were unaware that there were extensive tunnel systems back of the trenches. The trenches seem to get all the publicity, but the tunnels were also important to the war effort. I seem to recall that at Vimy there was something like 20 kilometres of tunnels behind the lines – and most not open to the public today. There are certain dangers in those 100-year-old tunnels, tourists getting lost not the least of them. A command post in the simulated tunnel system. Perhaps the most interesting part of the museum was outdoors, where a trench system has been built. There you can see the different styles of trenches used by the different countries and the different enclosures that were part of them. Of course it is sanitized: no rats, no mud, and no shells hitting the ground nearby. Not at all like it was for the soldiers during the First World War. No museum can really replicate the experience – which is something we should be thankful for. Or maybe we should wish that the horror of war could be experienced in some sort of realistic simulation: the noise, the smells, the blood, the screams of the dying, the days without sleep, the fear of imminent death. If we could somehow create such a simulation, not the unrealistic video game experience, perhaps it could be made mandatory for all aspiring politicians to undergo it. It seems few of our politicians have any first-hand experience of what it is like to be in combat. Perhaps if they experienced war, even if only a simulation, they might work together a little harder to prevent future conflicts. 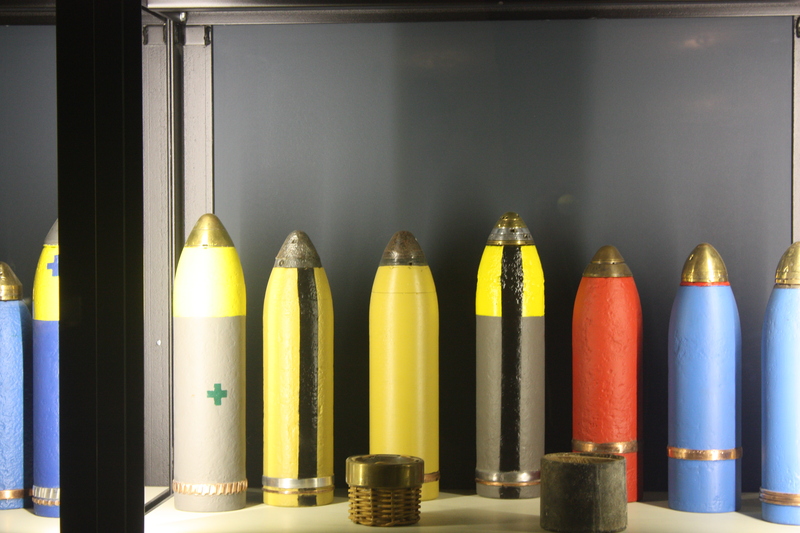 Century-old artillery shells on display at Memorial Museum Passchendaele 1917. I’m glad we went to Memorial Museum Passchendaele 1917, but that’s primarily because I am an information junkie and can almost never get enough of museums. For the casual tourist though, I think either one of either it or the In Flanders Fields Museum in Ypres would be sufficient.